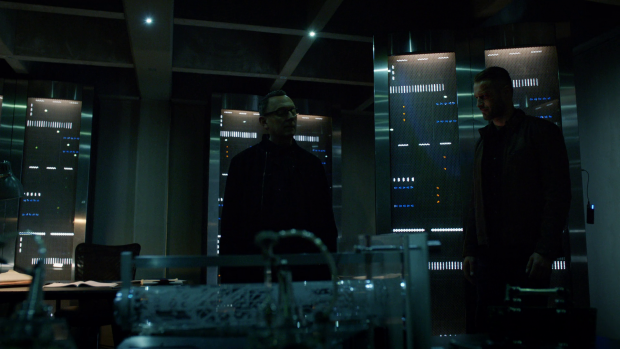 Arrow explores the question of Vince’s loyalty as Cayden James’ stranglehold on Star City makes the overall situation more urgent for the two vigilante teams. Last week treated Vince as a risk. Trusting him to deliver accurate information and not lead either team into a trap had a lot of danger attached to it and left the question of his true allegiance lingering meaning that working with him as a choice to be carefully considered. This episode answers that question by making it clear that Vince isn’t loyal to Cayden James and is genuine in his desire to bring down his operation. I’m impressed that the episode also answers why Vince doesn’t just kill Cayden James when he’s not looking by making his goal to locate and stop the thermobaric bomb that James has ready to deploy whenever he wants. In honesty I had forgotten that he had this weapon because of everything else that has been going on but it’s good to see it addressed and have it form part of Vince’s central motivation. His background is in undercover police work so it makes sense that he would bide his time and play the long game in order to accomplish a larger goal. Dinah and Vince’s relationship forms the emotional core for this episode and is used well for the most part. Dinah struggled with the notion of trusting Vince after learning that he was working with Cayden James but eventually came around to the idea because she was willing to believe that he couldn’t have changed that much since she thought that he died. By the time this episode begins she is fully on board with trusting him and rekindles their relationship. There was always the chance that Dinah was being set up for further disappointment but Vince proves to be genuine so there has to be another way to mine drama out of the situation. Characters pretending to ally themselves with a group while working against them always provides an automatic source of tension as there is always the risk of being caught and facing the obvious consequences of that. Vince is among some very dangerous people so the penalty for betraying them is very clear. Good use of Vince’s tenuous position is made by having Cayden James be suspicious of him throughout. The root of this seems to be when Vince killed one of their group last week which raised a red flag because none of Oliver’s team would apparently do that. It’s unclear if Wild Dog actually uses lethal bullets or not but for the sake of argument we’ll assume that James knows both versions of Team Arrow well enough to be certain that it doesn’t fit with their style to kill someone like that. Vince tries to cover by saying that a nearby cop got lucky but it’s clearly not enough for James who remains very suspicious. This is where Cayden James really shines as a villain and good use is made of Michael Emerson’s acting talents. The scenes between Cayden James and Vince are filled with tension thanks to Michael Emerson’s sinister performance. It’s clear that James is sizing Vince up looking for any sign of dishonesty. 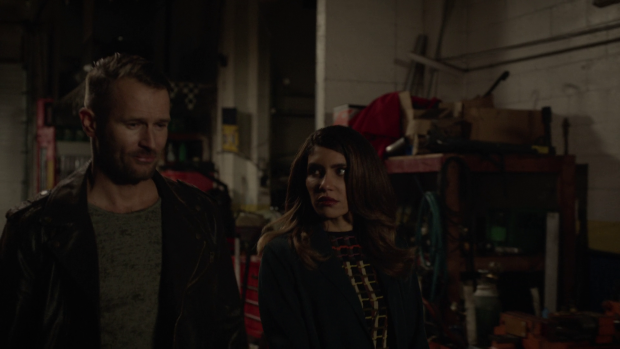 Johann Urb does a great job playing Vince with a near perfect poker face while still appearing as if he knows that he is close to being found out. 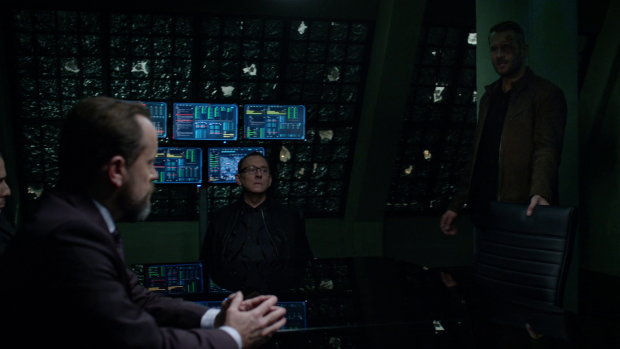 In order for Cayden James to be an engaging villain he has to be a competent challenge for Team Arrow and not consistently foiled. His approach to dealing with Vince is one way to do this as it shows how observant he is. The execution of this is somewhat sloppy as Vince isn’t exactly clever about sneaking around and his excuses are really flimsy but the idea is sound enough. Cayden James would have to have complete awareness of the members of his team in order to keep them in line. Seeing through Vince being duplicitous is expected for someone as well organised and intelligent as he is. Despite that some strong work is done with Vince to make him sympathetic enough for his death to have meaning outside of his connection to Dinah. Vigilante as a character was often problematic though the idea of him was sound as he represented Oliver Queen at the earliest stage of his journey into becoming Green Arrow. It took a long time for Oliver to develop to the pragmatic and compassionate character we have now and it has been well earned over the course of the series. Vince goes from vengeful murderous vigilante to compassionate and righteous in the space pretty much the previous episode and this one. It’s a reasonable arc to follow and does offer Oliver a mirror image of his early days as a vigilante himself but it’s far too quick and feels unearned. Oliver confronting Vince about not trusting him works well. 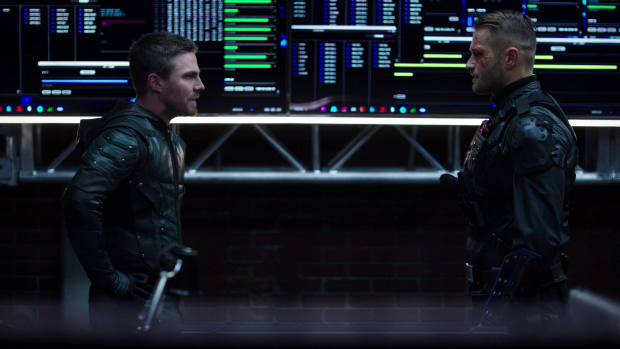 Stephen Amell and Johann Urb make a good physical match for one another and both project the required stoicism to show that neither is phased by the other. There is a heavy implication that Oliver sees a lot of himself in Vince and that’s part of what inspires his lack of trust. The fact that Vince has done very little to earn it as far as Oliver is concerned is also a consideration to bear in mind but the main thing is the comparison between them but as with Vince’s arc it is resolved too quickly to carry much weight. Dinah’s development works a lot better because we are able to see Vince through her eyes and follow her as she wonders how to approach the situation. The flashbacks make sense on a conceptual level because the situation heavily reminds her of what happened leading up to her getting her powers and believing that Vince was killed. Comparing the present day situation to events in the past has been a hallmark of the flashbacks throughout the run of this show and the same trend is followed here but there’s a lack of sophistication to it. It’s interesting in theory to explore their relationship prior to them getting their powers but in practice it’s a checklist of everything we’ve already heard about. The mechanical details of them maintaining a cover identity isn’t the compelling part of the story. If the focus had been on showing what made them fall for each other and exploring their reaction to feeling like their cover story might be at risk then there would be something worth seeing in there. If this is supposed to be an emotional story about Dinah being afraid of losing the man she loves for a second time then the flashbacks should inform that by exploring that relationship. There isn’t time to do that in the present day because of how quickly the plot is moving but the flashbacks can skip days, weeks or months at a time to quickly show the growth of that relationship but the opportunity is wasted by spending time on plot that didn’t need to be restated. 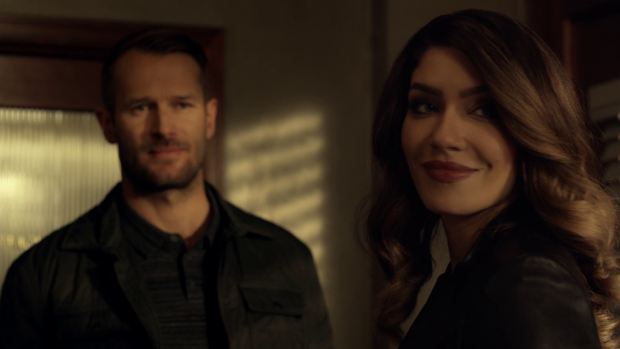 Juliana Harkavy and Johann Urb carry these scenes because they perform well and have natural chemistry but the material doesn’t match the performances they give so it can only be so effective. The two team dynamic is further explored though to a lesser extent than I was expecting. It makes sense that they have the same goals so share information but it feels like the writers are finding excuses to bring them back together rather than making use of them being apart and finding different ways to take on Cayden James. A divided front could be the thing he doesn’t anticipate therefore exposing a vulnerability for example but so far the teams have been working together just with more tension between them than there was when they were a combined unit. Strategy is the main source of the conflict between them. A decision has to be made between going after the bomb and saving Vince. The window of opportunity is very small as the bomb will soon be moved but Vince has been captured and is being tortured for betraying the cabal of villains. 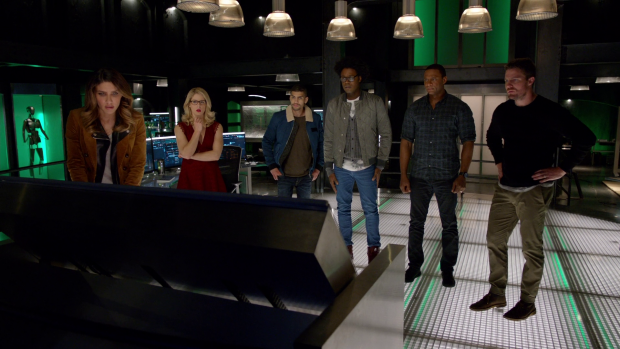 Both teams see things differently with Team Arrow feeling that their priority is the bomb and the Outsiders focused on saving Vince. Team Arrow’s outlook is the bigger picture focus where the Outsiders react emotionally but make it very clear that they’re fighting to save those they care about. Neither side is wrong in a complete sense as the arguments for both are valid. Naturally the teams split up and go after their respective goals which results in both of them failing. Oliver lacks the man power to secure the bomb and is overwhelmed by superior numbers while Dinah falls into Cayden James’ trap and has to watch Evil Laurel kill Vince right in front of her. This does start something that could be the distinguishing factor between both teams. Dinah ends the episode full of rage and grief with vengeance firmly on her mind which effectively resets her character to her mindset when she first appeared. Having characters go backwards in their development is a risky move but it makes sense considering Dinah has been forced to relive something that she already thought that she had dealt with. Now she’s out for blood and going after Cayden James as well as Laurel which might make the Outsiders a different take on Team Arrow as they existed in the first season. Personally I’m hoping that the spin on it will be unique to those characters but for now it could be interesting to see a vengeful and unrestrained Dinah. Her final scene with Oliver calls out a problem this show has always had with Oliver. Dinah blames him for Vince’s death to an extent because he chose going after the bomb rather than saving his life. The point is made that if this had been someone Oliver really cared about then the team would have prioritised them and it’s hard to disagree. How many times has Oliver been seen to ignore the bigger picture or even common sense in order to save Diggle, Felicity, Thea or anyone else he happens to be close to. The fact that he is blind to that when someone else wants to focus on saving the life of someone they care about paints Oliver in a very self serving right and I get the impression that he had never considered that about himself before. The fact that Oliver does that isn’t a bad thing because it adds to his flawed nature but the fact that it becomes known to him and he can now work on correcting that flaw might be interesting. There is a heavy implication that there is a larger antagonist pulling strings for an as yet unknown reason. The footage of Oliver killing Cayden James’ son has been clearly doctored and is apparently consistent with the photograph of Oliver as the Green Arrow so it’s clear that James didn’t come by this information himself and that someone is perhaps manipulating him. If all James wants to do is avenge his son by taking it out on Oliver then his plan seems like complete overkill; it feels like James might be working for someone and takes the opportunity to get back at Oliver as a bonus though there is evidence that James is also unaware that he is being manipulated. 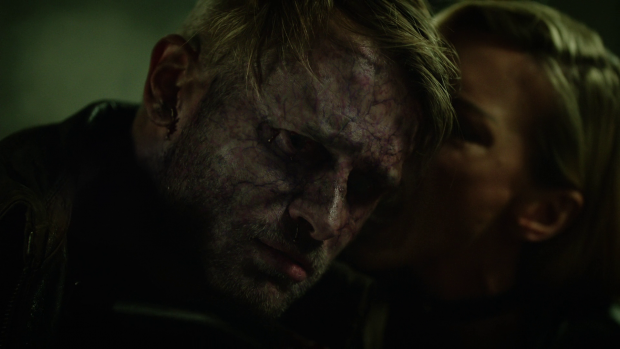 A bizarre subplot involving Quentin and Thea trying to tempt Evil Laurel into reforming is held together by strong performances but feels somewhat out of place. We’ve been over Quentin seeing goodness in Evil Laurel before and this episode doesn’t really bring anything new to the table other than a half baked attempt to force Evil Laurel into seeing all the good her counterpart did. Paul Blackthorne sells the material as well as he can and Katie Cassidy does a capable job showing a more conflicted Evil Laurel which pays off when she kills Vince. It’s obvious that Quentin won’t lose hope on redeeming her even after learning what she did so there’s no real movement here in scenes that would have been better spent on something else. A solid episode that does a capable job of developing Vince as a character enough to make his death matter. Dinah and Vince’s relationship forms the emotional core of the episode and is certainly well acted though everything moves a little too quickly to be truly effective. The flashbacks focus on the mechanics of a story we already know rather than the relationship behind it which means that they don’t really work as well as they should. Cayden James continues to prove formidable as he isn’t fooled by Vince’s treachery. A villain like James should be able to see through it so it’s good that he does but there’s a lot of tension before the reveal that Vince has failed to fool him. Having this knock onto Team Arrow and the Outsiders by them being forced to choose between finding James’ bomb and saving Vince works really well especially since both fail and Dinah is sent down a really dark path that also calls attention to the fact that Oliver is somewhat hypocritical when it comes to who he chooses to stay.